Research depicts the likelihood of finding employment abroad is increased by studying abroad. According to studies, Erasmus students may be widening their career prospects by studying abroad. In a study co-authored by leading economist Matthias Parey, research shows that graduates that have studied abroad are roughly 15% more likely to work abroad following their graduation. In the current financial climate, any so called ‘edge’ in the job market is essential and the advantage of having studying abroad can make you stand out over your peers. The Erasmus Mundus programme is one of the main contributors to this trend and is nearing its 30th anniversary. Erasmus is a European Union funded, student exchange programme founded in 1987. The programme offers students from 33 different countries the possibility to study abroad in another European country for a period of their university degrees. The European Union also provides funding for students wishing to take part and the programme has proven extremely popular since its inception. 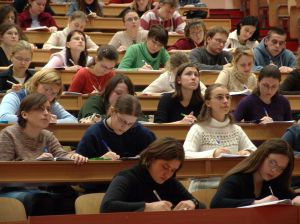 Since its introduction, over two million students have participated, over a network of European universities, with Britain being the top destination. There are obvious benefits to studying abroad, including learning a new language, gaining self confidence in being in an alien environment and generally benefiting from new experiences in a new culture. However, research has demonstrated that studying abroad is a true investment in a student’s future career. This is especially applicable for the Erasmus programme with the challenging times lying ahead for Europe. Even in the student market outside of Europe, it is clear that the international student is extremely valuable as a high skilled immigrant. For example, in universities in the United States, over half of the science and engineering doctoral students are international students. Foreign students account for almost 60% of the growth of PhD science and engineering students in the US. Consequently, after over 25 years, the Erasmus programme is proving more necessary than ever and the recent research in studying abroad demonstrate that, in general, mobility decisions during university do have long-term effects on the careers of individuals. In particular, mobility during your degree has proven to mean that there will be a higher possibility of you having mobility during your career.